After debuting in January with the original Honor in Vengeance, developer MichaelArts returns with the sequel, titled Honor in Vengeance II funnily enough, a 3D space shooter centred on story and action. At first glance, Honor in Vengeance II is possibly the best tech demo available on the XBLIG marketplace. 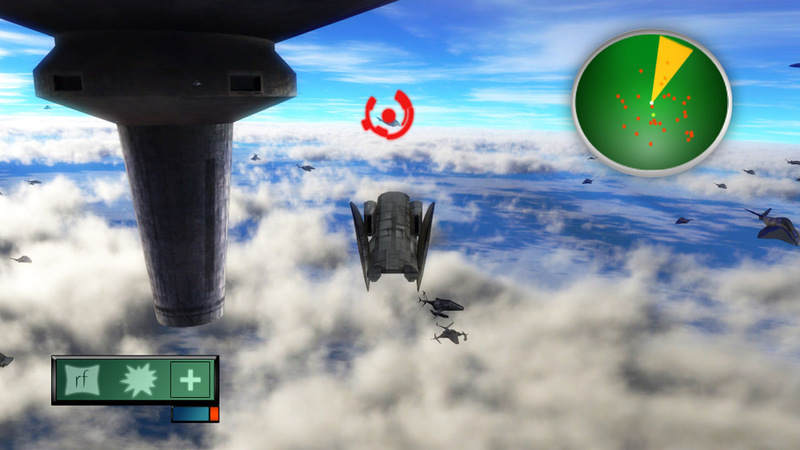 While most indie games choose to stay retro, with 2D gameplay and pixelly sprites, this is a fully 3D environment, with well-modelled spaceships and levels. At times, you could even be excused for mistaking this for a full retail release — soaring miles above a planet’s surface makes the best use of the 360’s power that I have seen in a game of this scale. Gameplay is more than functional, if a little basic. You can accelerate, steer and shoot, as you might expect, and you can also command teammates into different formations, although this doesn’t seem to make too much of a difference. Shoot enough enemies down and you’ll be rewarded with a powerup of your choosing: rapid fire, homing missiles or temporary invincibility, but your choice here is unlikely to result in a life-or-death scenario. What I found remarkable is that this felt like a real, full game to start with. I was flying around a 3D space, with decent graphics and controls that didn’t feel like I was attempting to strangle a giraffe. There is little complexity to what can be achieved, which may turn some players off, but the simplicity of it gives it a nice arcadey feel, which suits me fine. Additionally, real production values are shown: it’s clear some actual thought has been put into the plot, and effort into the presentation. There’s even voice acting! So, the boxes are ticked so far: this is one of the sturdiest games available in the indie marketplace. But functionality alone does not make for a great game, there needs to be a decent structure to lead the player along, and this is where Honor in Vengeance II is lacking. A major problem I encountered is the absence of direction or objective, and as a result often found it difficult to proceed. One level told me to “destroy the fighters,” and left it at that. Can you be a little more specific, game? I was plunged head first into a sea of enemy spacecraft, with a little scenery, and nothing to do but shoot them down and explore a little. The game offers no hints as to whether you are progressing in any way, and so I aimlessly shot down dozens of ships for half an hour without reward. The enemies themselves are pretty brain dead, offering no challenge to the player. While initially it is impressive to be faced with such a vast number swarming around, they rarely take any initiative, or even attack, meaning that picking them off is like shooting fish in a barrel. As a result, a lot of my time playing was simply spent circling around, shooting down as many as I could, then circling around again, diving through the herd with little danger each time. Lather, rinse, repeat. Not too exciting, especially considering there is minimal variety in weaponry, and the ones you are given don’t pack too mighty a punch. Therefore, Honor in Vengeance II is not as impressive as it might seem at first. It is exciting to see something like this exist on the indie game scene, especially on the Xbox 360, as it implies innovation and thinking outside the typical indie games offered, but the execution is somewhat sloppy. The solution here is simple: another sequel is required. If as much time was put into the overall design of the game and world, rather than the mechanics, then Honor in Vengeance could be a force to be reckoned with. However, at the moment there is just not enough here to keep players satisfied. My suggestion would be to hold off for now and wait until MichaelArts can figure out how to make an enjoyable game, instead of just an extremely playable one. It’s a shame to be so down on Honor in Vengeance II, as I really wanted to love it. With more exciting levels and things to do this could be a blast, but at the moment it’s just an excuse to slaughter dozens of defenseless spaceships aimlessly — which isn’t as fun as it might sound. I think this would be a pretty cool game to play. Great review. Thanks for the contest. Nice review, hope I win one of these & thanks for the contest! Read over the review and now I want the game! The demo was okay but I agree with the review score. wtf? this is one of the most stand out indie games ive played on xbox. Please enter me for a code for this game. Thanks! I’d like to give this game a try. Here’s to hoping there are good updates?